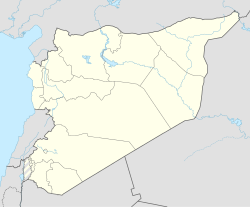 Manbij (Arabic: منبج‎, Kurdish: Minbic‎) is a city in the northeast of Aleppo Governorate in northern Syria, 30 kilometers west of the Euphrates. In the 2004 census by the Central Bureau of Statistics (CBS), Manbij had a population of nearly 100,000. The population of Manbij is largely Arab, with Kurdish, Circassian and Chechen minorities. Many of its residents practice Naqshbandi Sufism. Manbij is the administrative center of Nahiya Manbij and Manbij District. Coins struck at the city before Alexander's conquest record the Aramean name of the city as Mnbg (meaning spring site). For the Assyrians it was known as Nappigu (Nanpigi). The place appears in Greek as Bambyce and Pliny (v. 23) tells us its Syrian name was Mabog (also Mabbog, Mabbogh). As a center of the worship of the Syrian goddess Atargatis, it became known to the Greeks as the Ἱερόπολις (Hierópolis) 'city of the sanctuary', and finally as Ἱεράπολις (Hierápolis) 'holy city'. This worship of Atargatis was immortalized in De Dea Syria which has traditionally been attributed to Lucian of Samosata, who gave a full description of the religious cult of the shrine and the tank of sacred fish of Atargatis, of which Aelian also relates marvels. According to the De Dea Syria, the worship was of a phallic character, votaries offering little male figures of wood and bronze. There were also huge phalli set up like obelisks before the temple, which were ceremoniously climbed once a year and decorated. The Arameans called the city "Mnbg" (Manbug). Manbij was part of the kingdom of Bit Adini and was annexed by the Assyrians in 856 BC. The Assyrian king Shalmaneser III renamed it Lita-Ashur and built a royal palace. The city was reconquered by the Assyrian king Tiglath-Pileser III in 738 BC. The sanctuary of Atargatis predate the Macedonian conquest as it seems that the city was the center of a dynasty of Aramean priest-kings ruling at the very end of the Achaemenid Empire; two kings are known, 'Abyati and Abd-Hadad. The fate of Abd-Hadad is not known but the city came firmly under the Macedonian empire, and prospered under the rule of the Seleucids who made it the chief station on their main road between Antioch and Seleucia on the Tigris. The temple was sacked by Crassus on his way to meet the Parthians (53 BC). The coinage of the city begins in the 4th century BC with the coins of the priest-kings followed by the Aramaic series of the Macedonian and Seleucid monarchs. They show Atargatis either as a bust with mural crown or as riding on a lion. She continues to supply the chief type even during imperial Roman times, being generally shown seated with the tympanum in her hand. Other coins substitute the legend Θεᾶς Συρίας Ἱεροπολιτῶν Theas Syrias Ieropoliton within a wreath. In the 3rd century, the city was the capital of Euphratensis province and one of the great cities of Syria. Procopius called it the greatest in that part of the world. It was, however, in ruinous state when Julian gathered his troops there before marching to his defeat and death in Mesopotamia. Sassanid Emperor Khosrau I held it to ransom after Byzantine Emperor Justinian I had failed to defend it. The Abbasid caliph Harun al-Rashid restored Manbij at the end of the 8th century, making it the capital of al-Awasim (Byzantine frontier province). Afterward, the city became a point of contention between the Byzantines, Arabs and Turkic groups. The Arab chieftain Salih ibn Mirdas captured it circa 1022, making Manbij, along with Balis and al-Rahba, the foundation of his future Mirdasid emirate. At the time, Manbij was one of the most important fortresses in northern Syria. In 1068, the Byzantine emperor Romanos Diogenes captured it, defeated the Mirdasids and their Bedouin allies, killed the city's inhabitants and plundered the surrounding countryside. Romanos later withdrew due to a severe shortage of food and supplies. The Crusaders never captured Manbij during their 11th–12th century invasions of the Levant, but the Latin archbishopric of Hierapolis was reestablished in the town of Duluk by 1134. By 1152, Duluk and Manbij were captured by the Zengids under Nur ad-Din, who reconstructed and strengthened the city's fortress. The Ayyubid sultan, Saladin, conquered it from its Zengid lord, Qutb ad-Din Inal, in 1175. In 1260, the Mongols under Hulagu destroyed Ayyubid Manbij, which was consequently abandoned by its then-Turkmen inhabitants. Manbij's ruins are extensive but mostly belong to the later period of its history. Most of the monuments of Manbij are gone due to it being a strategically important place being located at a group of crossroads unlike Cyrrhus whose bishop was under Manbij. Henry Maundrell who visited Mambij in 1699 noticed a rock with large busts of a male and a female with two eagles below them. Another rock had three figures sculpted in low relief. Volney who visited the place in 18th century mentioned that no remains of Atargatis' temple existed. Alexander Drummond noticed walls of a square building which he said was Atargatis' temple and also a base in the building which he identified as an altar. Travellers in the 19th century had recorded some of its ancient remains, but now almost all of them, including Atargatis' temple, its sacred lake, colonnades, Roman baths, Roman theatres, walls and churches built by the Byzantine Empire as well as madrassas built in the medieval era, have been destroyed. The sacred lake of Atargatis has disappeared and has been converted into a football field. Only a part of the wall that enclosed the lake has survived but no ruins of Atargatis' temple remains. Some ancient Roman military stele also exist. Ruins of the southern wall that enclosed Atargatis' temple still survive. The walls of the city still exist but have been plundered. The Ottoman government resettled the area with Circassian refugees in 1878. The destruction of pre-modern Manbij has been attributed to its resettlement by Circassian and Armenian refugees. As of 1911, its 1,500 inhabitants were all Circassians. Prior to and in the early years of the Syrian Civil War, Manbij had an ethnically diverse population of Arab, Kurdish and Circassian Sunni Muslims, many of whom followed the Naqshbandi Sufi order. The city's socio-political life was dominated by its main tribes. Tribal leaders served as the mediators and arbiters of major disputes in Manbij, while the state's security forces largely dealt with petty offenses. The city was relatively liberal compared to other Sunni Muslim-majority cities in the countryside of Aleppo. During the civil war, on 20 July 2012, Manbij fell to local rebel forces who thereafter administered the city. ln December, there was an election to appoint a local council. In January 2014, forces from the Islamic State of Iraq and the Levant (ISIL) took over the city after ousting the rebels. The city has since become a hub for trading in looted artifacts and archaeological digging equipment. In June 2016, the Syrian Democratic Forces (SDF) launched an offensive to capture Manbij, and by June 8 had fully encircled the city. On 12 August the SDF had established full control over Manbij after a two-month battle. By 15 August, thousands of previously displaced citizens of Manbij were reported returning. On 19 August 2016, the Manbij Military Council issued a written statement announcing it had taken over the security of Manbij city center and villages from the SDF, of which it is a component. Today Manbij is self-administered by the Manbij City Council, co-chaired by Sheikh Farouk al-Mashi and Salih Haji Mohammed, as part of Shahba region within the de facto autonomous Federation of Northern Syria – Rojava framework. While public administration including public schools has regained secular normalcy after the ISIL episode, a reconciliation committee to overcome rifts created by the civil war was formed, and international humanitarian aid has been delivered, the democratic confederalist political program of Rojava is driving political and societal transformations in terms of direct democracy and gender equality. Reconstruction after devastations of civil war combat remains a major challenge. Manbij today also is a hub for Combined Joint Task Force – Operation Inherent Resolve training of new SDF recruits in the fight against ISIL and other Islamist militias in Syria. On 26 February, the United States announced its support for the security of the Manbij Military Council. The United States also reportedly sent special forces and several military convoys to Manbij after the announcement. On 12 March 2017, the Legislative Assembly of Manbij approved the elected co-presidents who then took office. During the meeting the departments of the committee members, co-presidents and committees were determined after speeches and evaluations. 13 committees where determined. The 13 new committees include 71 Arabs, 43 Kurds, 10 Turkmen, 8 Circassians, an Armenian and a Chechen. On 1 November 2018 Turkish and US troops began joint patrols around Manbij along the front lines of the Euphrates Shield rebel territory and the Manbij Military Council. The joint patrols were seen as part of a "roadmap" for easing tensions between militants in the region and tensions between the two NATO allies. On 28 December 2018, the Syrian government's media said the Syrian Army had entered Manbij, a claim that was disputed by other sources, which reported that Syrian troops had deployed in the area around the city. On 15 January 2019, a suicide attack claimed by ISIL left at least 19 casualties. Among them, four U.S. military personnel are reported dead and three wounded. Two of the dead were U.S. Army soldiers, one was a U.S. Department of Defense civilian working in support of the Defense Intelligence Agency, and one was an employee of Valiant Integrated Services, a contractor supporting American operations. Lequien names ten bishops of Hierapolis. Among the best-known are Alexander of Hierapolis, an ardent advocate of Nestorianism, who died in exile in Egypt; Philoxenus of Mabbug, a famous Miaphysite scholar; and Stephen of Hierapolis (c. 600), author of a life of St. Golindouch. In the sixth century, the metropolitan see had nine suffragan bishoprics. Chabot mentions thirteen Jacobite archbishops from the ninth to the twelfth century. One Latin bishop, Franco, in 1136, is known. Manbij has a cold semi-arid climate (Köppen climate classification BSk) with influences of a continental climate during winter with hot dry summers and cool wet and occasionally snowy winters. The average high temperature in January is 7.8 °C (46.0 °F) and the average high temperature in August is 38.1 °C (100.6 °F) . The snow falls usually in January, February or December. Manbij is served by two major roads, Route M4 and Route 216. There is no airport near Manbij, the nearest is in Aleppo. ^ "In the small city of Manbij in Syria, we could see US and Turkish troops shooting at each other if tensions continue". The Independent. 2 March 2018. Retrieved 29 December 2018. ^ a b Khaddour, Kheder; Mazur, Kevin (Winter 2013). "The Struggle for Syria's Regions". Middle East Research and Information Project. Retrieved 27 August 2015. ^ Trevor Bryce (2009). The Routledge Handbook of the Peoples and Places of Ancient Western Asia: The Near East from the Early Bronze Age to the Fall of the Persian Empire. p. 498. ^ Irene Winter (2009). On Art in the Ancient Near East Volume I: Of the First Millennium BCE. p. 564. ^ Jonas Carl Greenfield (2001). 'Al Kanfei Yonah. p. 285. ^ Trevor Bryce (2009). The Routledge Handbook of the Peoples and Places of Ancient Western Asia: The Near East from the Early Bronze Age to the Fall of the Persian Empire. p. 479. ^ Fergus Millar (1993). The Roman Near East, 31 B.C.-A.D. 337. p. 244. ^ Edward Lipiński (2000). The Aramaeans: Their Ancient History, Culture, Religion. p. 633. ^ Kevin Butcher (2004). Coinage in Roman Syria: Northern Syria, 64 BC-AD 253. p. 24. ^ John D Grainger (2014). Seleukos Nikator (Routledge Revivals): Constructing a Hellenistic Kingdom. p. 147. ^ Cobb, Paul M. (2001). White Banners: Contention in 'Abbasid Syria, 750-880. SUNY Press. p. 12. ISBN 9780791448809. ^ Zakkar, Suhayl (1971). The Emirate of Aleppo: 1004–1094. Aleppo: Dar al-Amanah. p. 53. ^ a b Basan, Osman Aziz (2010). The Great Seljuqs: A History. Routledge. p. 76. ^ a b Ibn al-Athir (2002). Richards, D.S. (ed.). The Annals of the Saljuq Turks: Selections from Al-Kamil Fi'l-Ta'rikh of Ibn Al-Athir. Routledge. p. 166. ^ a b Hamilton, Bernard (2006). "The Growth of the Latin Church of Antioch". In Ciggaar, K.; Metcalf, M. (eds.). East and West in the Medieval Eastern Mediterranean: Antioch from the Byzantine Reconquest Until the End of the Crusader Principality. Peeters Publishers. pp. 175, 180. ^ Hillenbrand, Carole (2000). The Crusades: Islamic Perspectives. Routledge. p. 474. ^ Lyons, Malcolm Cameron; Jackson, D. E. P. (1982). Saladin: The Politics of the Holy War. Cambridge University Press. p. 105. ^ Amitai-Preiss, Reuven (1995). Mongols and Mamluks: The Mamluk-Ilkhanid War, 1260-128. Cambridge University Press. p. 204. ^ a b Syria's Monuments: Their Survival and Destruction. pp. 243, 244. ^ Monuments of Syria: A Guide. pp. 202, 203. ^ a b Herbermann, Charles, ed. (1913). "Hierapolis" . Catholic Encyclopedia. New York: Robert Appleton Company. ^ "المجالس المحلية .. خطوة نحو الأمام". SyriaTomorrow. 9 December 2012. Retrieved 9 December 2012. ^ "Al Qaeda chief Zawahri tells Islamists in Syria to unite - audio". Reuters. 2015-01-23. Retrieved 27 August 2015. ^ "SDF closes in on ISIL supply route in Syria's Manbij". Al Jazeera. 3 June 2016. Retrieved 3 June 2016. ^ "U.S.-backed forces cut off all routes into IS-held Manbij: Syrian Observatory". Reuters. 8 June 2016. ^ Charkatli, Izat (2016-08-12). "SDF captures ISIS's largest stronghold in Aleppo". Retrieved 2016-08-13. ^ "Thousands Return To Manbij After Islamic State Militants Flee City". News Deeply. 15 August 2016. Retrieved 2016-10-15. ^ "On the Front Line in the Bloody Fight to Take Manbij From ISIS". The Daily Beast. 5 June 2016. Retrieved 2016-10-15. ^ "Syrian kids relish return to school in ex-IS bastion". ReliefWeb (AFP). 28 September 2016. Retrieved 2016-10-15. ^ "Manbij: students back to school after ISIS explosives dismantled". ARA News. 10 October 2016. Retrieved 2016-10-15. ^ "Reconciliation committee formed of Manbij tribal notables and intellectuals". Hawar News Agency. 9 October 2016. Retrieved 2016-10-15. ^ "US-led coalition delivering aid to civilians in post-ISIS Manbij". ARA News. 25 September 2016. Retrieved 2016-10-15. ^ "Syrian women liberated from Isis are joining the police to protect their city". The Independent. 13 October 2016. Retrieved 2016-10-15. ^ "Liberated from ISIS suppression, women of Manbij join security forces (includes Video)". ARA News. 13 October 2016. Retrieved 2016-10-15. ^ "(Video) Manbij after liberation". 23 August 2016. Retrieved 2016-10-15. ^ "U.S. military aid is fueling big ambitions for Syria's leftist Kurdish militia". 7 January 2017. ^ Antonopoulos, Paul (26 February 2017). "US confirms support for Manbij Military Council despite Turkish threats". ^ Sputnik. "US Sets Up Military Base in Syrian Manbij to 'Defend It From Turkish Attack'". ^ "Manbij declares new administration in much-contested city". Kom News. 12 March 2017. Archived from the original on 14 March 2017. Retrieved 14 March 2017. ^ "US, Turkey begin joint patrols around northern Syrian town of Manbij". 1 November 2018. ^ Syria army enters Kurdish-held Manbij: state media: Reported troop entry into Manbij comes after Kurdish YPG asked for government help in preventing a 'Turkish invasion'. Aljazeera, 28 December 2018. ^ Syria war: Government forces 'enter Manbij' amid Turkey threats. BBC, 28 December 2018. ^ "Americans slain in Syria attack: A Green Beret, a former SEAL and two language specialists". The Washington Post. January 18, 2019. Retrieved January 21, 2019. ^ James Allan Evans (2011). The Power Game in Byzantium: Antonina and the Empress Theodora. A&C Black. p. 9. ISBN 9781441120403. Wikimedia Commons has media related to Manbij.